Get top weight on the top! Table Top Scales are most useful, handy, sturdy and easy to use than the manual, traditional scales. These weighing scales require less space. Besides they are powder coated and thus have a fantastic finish to place on the counter. Most importantly, weighing on these scales is to the minutest point and hence accurate. These easy-to-use scales are composed of weighing display of high resolution, 12.5 mm LED display, built-in rear display and battery back-up. Scoop or Flat Bowl for keeping the material to be weighed is also available as per the requirement. All of these features, make table top weighing scales very effective and convenient. The technology used to make these scales ensures accurate weighing and perfect display with exact computing. A great variety is available in these scales through several models of different capacities, accuracy, pan-size and classes. Some scales are also available with a pole display for the convenience of the customers. All of these accurately designed scales have protected internal calibration, easy to operate key-size and robust making. 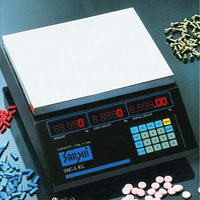 Table Top Scales are specifically made to meet all kinds of weighing needs in the most convenient and precise manner.